The cry was Patriotism, Loyalty to the Nation State or Nationalism; call it Jingoistic if you like but it was precisely the same words that was the catch-cry to entice young men and women to volunteer to help defend their country in WW1 and WW2 and if necessary to die for their country, no other pleas to sacrifice one’s life would have worked quite as well. It called on one’s inherent sense of belonging to an ethnic group, to a like-culture which defined who you were. That was 70 years ago the world has changed and now Patriotism, Loyalty to the Nation state or Nationalism is considered the true enemy. Why is that, why have these words taken on a totally different meaning, who changed the meaning, why are they equated with Narnsyism, Fascism and the Far Right; they never used to. So what has changed? It is a subject that is never brought up by the Press or Controlled TV Media. The words loyalty and Patriotism have been changed to give a perception of Fascism, a dark, negative, threatening, anti -establishment connotation. This was not so in 1939, quite the reverse. 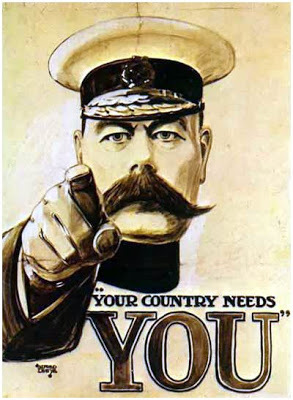 The military man on the poster pointing directly at you declaring the ‘Country Wants You’ did not say excepting Nationalists, Patriots and those loyal to the Nation State need not apply, he was particularly looking for you. As the Nurnberg trials were taking place it was decided by the victors Europe’s future direction had to change, Nationalism or a sense of National identity was to be eradicated never again to emerge in Europe, it was seen as the cause of instability and wars that ravaged across Europe throughout its history. Nationalism? It is what it says on the tin, it is being able to identify with a National, ethnic and cultural group, which in the UK used to be British, the sub groups being English, Scottish, Welsh and Irish. Blurring the meaning and introducing many other sub groups would help blur ethnic identity. In nature it is achieved by introducing differing species. On a human scale it is achieved by changing the demographics for economic or political gain. In nature its purpose is not necessarily to eradicate the existing species but to seamless merge those with an introduced species ignoring the disproportionate breeding rates. The similarity in changing the characteristic and ethnic make-up of nations are obvious. Inviting 2 to 3 million Middle Eastern and African people into the UK is achieving this. The question one might ask is who benefits by changing the cultural, ethnic and religious demographics of a land mass? simply one who wishes to destroy a nation’s sense of self identity for a particular purpose. The quintessentially English look of many of our towns is fast disappearing. Whole swathes of London are taking on a Middle Eastern appearance; with Burka clad women invariably pushing baby strollers and Dhoti clad men speaking in foreign tongues throng the high streets. Many shops with Middle Eastern signage are common. The transformation is taking place daily in front of our eyes. Dewsbury, Ealing, Harrow, Hounslow, Slough, Newham, Redbridge and Tower hamlets have all been ceded to the Third World with the ethnic British group being in the minority. I could start listing towns. Apart from an event or events of cataclysmic proportions I doubt whether the changes that have been spreading across Europe and indeed the Western World since WW2 like an Ebola plague are reversible. Multiculturism is a tool to achieve Global rule and Global Corporatism commonly known as Fascism that is the aim. Multiculturism is one tool that will achieve this, but try and snuff out a nation’s self-identity is fraught with danger and it will be just that which will again ignite Nationalism in one way or another thorough Europe.